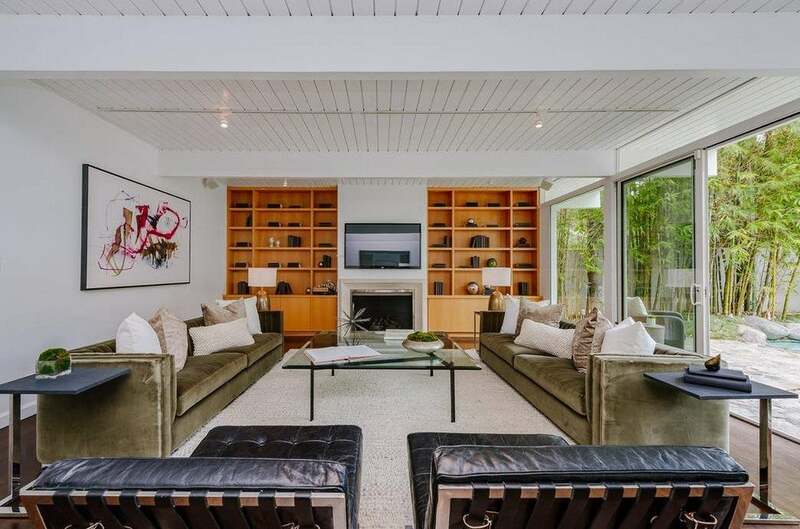 Peek inside the singer's $3 million mid-century home. The one thing Taylor Swift doesn’t have a problem shakin’ off? Her homes. Only hours after quietly selling one of her (apparently) many homes in Los Angeles for a cool $4 million, the singer also listed another nearby pad in Beverly Hills. So, how much is the real estate maven in the making asking for her abode this time? Per Trulia, the beloved 20-something artist hopes to score $2.95 million for this next bright and breezy mid-century pad. Built in 1959, the four-bedroom, five-bath home is classic in form, but has since been outfitted with all the modern amenities a globe-trotting popstar could ever need—including a top-notch security system, sprawling outdoor patio, and 1,000-bottle wine cellar. According to Trulia, the trendsetting singer-songwriter originally purchased the property back in 2012 for $1.7 million—mere pocket change to the now world-famous #GirlBoss. Decked out with floor-to-ceiling glass doors and soaring skylights, the charming home is a lesson in bringing the outdoors in. So, why would Swift want to suddenly get rid of her superior, light-filled LA escape? We’re guessing it might have something to do with paying for the $18 million NYC penthouse she picked up last October. Though the 3,000-square-foot spread might be considered small by celebrity standards, monstrous glass windows give the impression that the one-story space is much larger than it first appears. In the main living room, white painted wood beam ceilings and an imposing fireplace introduce an instant sense of personality and warmth to the formal sitting area. A prime spot for a Grammy or two (or three, or four…), the built-in shelving unit along the back wall would have undoubtedly doubled as a show-stopping focal point when thoughtfully styled with knick knacks, meaningful artifacts, and other personal collectibles. It’s no secret that we love a good skylight—and TSwift’s strategically placed additions do not disappoint. The way the day’s sunshine reflects off the home’s interior walls and helps to accentuate the mid-century abode’s intriguing lines only adds more depth and character to the architecture. Just off the galley-style kitchen sits a charming built-in breakfast nook In keeping with the SoCal home’s storage-friendly theme, the bonus dining space also features a slew of shelves. In each of the four bedrooms, large sliding doors offer quick and easy access to the sprawling patio and private courtyard just beyond. In this spacious, light-filled dwelling, the same whitewashed beams that grace the living room make a second appearance. Given the Blank Space artist’s chic taste in bedding (learn everything you need to know about her favorite sheets here), her room of choice would have, without a doubt, been styled to the max. Outside, picturesque mountain vistas back up to the lagoon-inspired pool, where sky-high hedges and lush greenery promise ultimate privacy (although if potential residents are still concerned about security, the fact that the home comes with 11 cameras will be of some comfort). Come summertime, a spacious deck where homeowners can barbecue, entertain, and (if they feel so inclined) whip out the guitar old-school Taylor style awaits nearby. Drew Mandile, Dean Mandile, and Brooke Napp of Sotheby’s International Realty represent the star-owned listing.